Join us and be part of the vegan revolution! You are invited to join our ever-growing local group and be part of something awesome and rewarding. It’s fun, inclusive and you will quickly discover our events include loads of deliciously good vegan food. These are open to all vegans and anyone who supports veganism or interested in adopting a plant-based lifestyle. The Vegan SuperHero campaign includes your monthly support. Relaunching the CVC to the CVS is an important and exciting time but its growth and success will largely depend on support we receive. Thank you in advance if you’re in a position to invest in our future. we are rich with valued supporters. Considered our standard membership option that never lets us down. 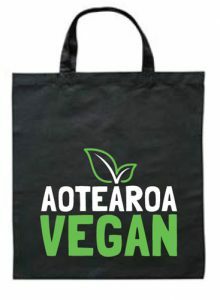 Includes our Aotearoa Vegan cotton shopping bag valued at $10. An excellent choice if you can afford a donation with your subscription. Valued ‘A’ for awesome, receiving your regular monthly donation (min $10) will truly give us super powers! 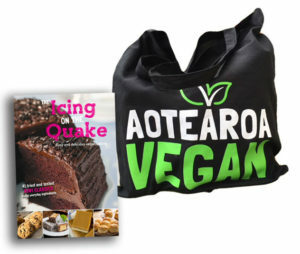 Includes a special member Vegan GOODIE BAG plus the Icing on the Quake cookbook. 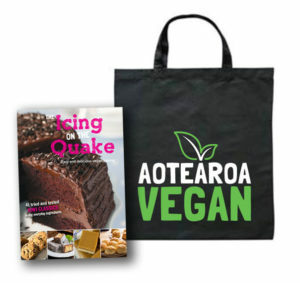 What is the Vegan SuperHero campaign? Our group has been working for the community since 2002. A recent change in our legal entity saw us becoming independent but it came at the cost of losing our funds and assets. To get us back on our feet and financially secure, the Vegan SuperHero contribution enable you to directly fund the growth and development of our group so we can continue to undertake our vital role in the community. You will also help ensure we retain our part-time worker to carry out so much essential work.